I’ve been reading Simon Southerton’s Losing a Lost Tribe. The first few chapters seem to set up a bit of strawman argument, saying that most church leaders and members believe in a 6000 year earth, against evolution, a global flood, etc. I want to ask a few different questions to see perceptions of yourself, as well as how you think members of your congregation would answer. I suspect the audience here is different than the general congregation, and am curious what people think. I don’t know about what “most” members believe, partly because I am pretty certain that of the members that do not believe in young earth creationism or a global flood, most of them wouldn’t be willing to say so in church. Evolution is a particularly unpopular thing to express belief in. The interesting thing to me is how much these views have modified over the past 20 years, and whether there is a correlation with level of education. I don’t know anyone who believes the earth is only 6,000 years old. I do know people who believe in a literal Adam and Eve who also believe they are figurative. I can see where Simon is coming from a little bit. Some members and leaders are very vocal and are definitely anti-evolution, perhaps young earth creationists, and they may give the impression that is what “the church” believes. But I think it’s a bit more complicated than that. The polls seem to indicate few readers here believe in a young earth. I know the church is officially neutral, but there are strident voices of some that quote church leaders being anti-evolution. I know BYU teaches evolution, and it seems like most moderns are not allergic to evolution, but it can be hard to decipher what today’s leaders think on these issues. They don’t talk about it publicly very much anymore. The poll needs a bit more nuance. For example, I believe there was a literal Adam & Eve, but I see them as the first covenant people, not the first living humans. Further, I believe there was a great flood at some point in time, but it was probably a local flood since there is no evidence of a global flood. I do think a slight majority hold more traditional views though. As for the age of the Earth, I think only a small percent of LDS believe in a 6000 year old Earth. Interesting. Every ward I’ve lived in there has been a robust group willing to defend evolution. There were also those who would defend anti-evolution views. Now literal Adam and global floods I’m generally the only one willing to express those ideas but I feel like in my non-scientific observation evolution has more support than a literal Adam. I would also hypothesize that more Mormons believe in a literal Adam than a global flood. I would also add that I was very grateful for president Eyring a conference or two ago sharing the story of his father writing a pro-science paper for the Q-15 explaining age of the earth. He flat out says the science showed the earth was older than 6,000 years. We need more of that. I know a few people who believe the earth is 6,000 years old. I know an even larger number of people who think Adam and Eve were literal people, Noah’s flood is a literal story, etc. I do not believe any of those things but I can understand why others do, since LDS theology is largely built on them being real people. Frankly, I’d be very curious to know how others account for Joseph’s theology of a literal Adam and Eve, Enoch, Melchizedek, Tower of Babel, etc. Joseph most certainly believed they were real people, several of whom he claimed appeared to him, and upon whom a lot of our restored theology is built. It seems very difficult to hold a figurative belief in all of that while simultaneously accepting the narrative on priesthood, keys, temples, etc. How is that done? In the last few months the previous bishop of my current ward got up in fast & testimony meeting and said no-one can truly call themselves Christian if they disagree with the Bible about the 6,000-yr-old age of the church. I live in an elderly ward, so maybe it’s skewed, but I’m confident well over half the wardmembers believe in young-earth theory, global flood, and literal Adam & Eve. Also, I think it would’ve been useful to separate the questions of literal Adam & Eve from the global flood. Pretty sure over 95% of the active LDS adults in my ward are anti-evolution. I’ve been in wards in the Midwest and in Provo where that wasn’t the case, but I’m certain if the issue came up in my current EQ or Sunday School class and I raised my hand to state my educated opinion (based on a quality biology education at BYU) I’d not have support from a single person in the class. I’ve heard plenty of anti-evolution comments in this ward. I’ve given up speaking out, and typically just walk out if I get too frustrated. No one else ever disagrees with these comments and no one else walks out of the classroom either. I recall in a BYU singles ward, a young man disagreeing with evolution as part of his testimony in a F&T meeting, and attending Sunday School immediately after and having the Sunday School teacher state to the class, before class officially started, that she didn’t think there was any conflict between our religion and evolution. In my former Midwest ward, the Bishop, YWP, and EQP all had degrees in biology, and the YWP was doing grad work in botany–specifically, plant evolution. Never heard a single word against evolution in that ward, and I’m certain that if I had, someone else in the room–likely a member of the ward council–would have vocally disagreed. I’m convinced that most bloggernacle participants live in wards that are a bit more liberal and well-educated than the average Mormon ward. That’s going to have an impact on surveys like these. I’m with JLM, both in thinking the poll should be more nuanced, and also in what I believe about the two ideas. I think there’s a sizable subsection of the church membership who both believe in a literal Adam and Eve (first people or not), and who reject a global flood given the geological evidence. There are plenty of science and engineering grads in my area at church. Even though this is a conservative area and there are lots of YECs in the other churches, there seem to be only a few in our ward. It helps that some of the most senior and respected leaders (and former leaders) are clearly not young earth creationists. This topic is rarely breached at church, in fact the last time I heard it was from the primary a couple years ago. We have to correct some hyper YECs among our home school associations, but that is much easier than mass indoctrination at the local public schools. I imagine that a higher percentage of previous wards may have been more biblical literalists, but a lower overall education level is probably the strongest predictor of the difference. Believing in Adam and Eve is part of being a Christian and an integral part of being LDS.If Adam fell that men might be, it’s clear Jesus and Adam are both necessary components of the plan of salvation. Cain and his secret combinations and his satanic oaths, man’s fall, the genealogies — all are necessary unless taken as metaphors. So how could people deny the scriptures and make the religion work? I have problems with evolution, but believe the earth took much longer to create than just six thousand years. The word used for “day” in Hebrew is exactly the equivalent of the English “day” (therefore it could be a 24-hour day or it could be “era” as “in my day”). According to my understanding, the earth was not created in our solar system, but was transported here after the fall. It also will not remain here, but will be moved again after the redemption. I wish I knew how to reconcile these things, but I often wonder about all the UFO sightings. We won’t know the answers to most of these things until the Millennium, and I’m looking forward to hearing the answers. A 6,000-year Earth isn’t necessary to my belief structure, but Adam and Eve are. I just put many of these questions on the back burner. I’ve never heard this before (and it goes against everything I studied as a geology major many moons ago), but I am generally curious on where this idea came from. I’m curious – does even a single commenter here know the Earth to be greater than 6000 years old? And, by “know,” I mean having direct, firsthand knowledge, as opposed to holding a mere belief which is based, in the end, upon philosophical assumptions mingled with evidence. It doesn’t matter that, once we make a couple of specific assumptions about what is real and how stuff works, the evidence of geology may be interpreted straightforwardly to indicate a 4.5 billion-year-old Earth, since evidence doesn’t interpret itself, and the conclusion is only as sure as the assumptions it is founded upon – which, in the end, are only assumptions, and are not knowledge. It is canonized that the Earth will have a temporal, as opposed to eternal, existence of 7000 years (D&C 77:6). Joseph apparently consistently said the Earth is on the order of 6000 years old (such as in TPJS p. 262). It is fair to say Joseph was a scriptural literalist, and he also explicitly taught literalism. We only reach for non-literal interpretations when we do not believe what is being literally said. But reaching for non-literal interpretations in the absence of actual knowledge contrary to the literal reading marks us not as believers, but as unbelievers. Might there be an association – causal, even – between childlike literalistic belief in the words of the scriptures, such as the literalism demonstrated and taught by Joseph, and possessing power with heaven? Has there ever been a non-literalist prophet – one with whom God himself conversed face-to-face, as he did with Joseph? Or have the heavens been shut as we have progressively (pun intended) pooh-poohed the alleged myths and traditions handed down to us by the childishness of our fathers in the scriptures? “When the earth was framed and brought into existence and man was placed upon it, it was near the throne of our Father in heaven. … But when man fell, the earth fell into space, and took up its abode in this planetary system. … This is the glory the earth came from, and when it is glorified it will return again unto the presence of the Father, and it will dwell there, and these intelligent beings that I am looking at, if they live worthy of it, will dwell upon this earth.” Brigham Young, Journal of Discourses, 17:143. Adam and the Flood, like the universe, is viewed scientifically and religiously. Viewpoints of one side that intend to mock or denigrate the other will be met defensively; losing their effectiveness to persuade. I remember picking up a book entitled “God and the Astronomers” , thinking it might strike a balance. Instead, the opening paragraph was a despairing comment about religion. Modern times have replaced the exclusion of one side with the exclusion of the other. I don’t think a belief in a 6K-year-old Earth is all that common. But I think it’s quite common for people in the Church to understand Genesis 1 literally with the exception that the events took place over long “creative periods” rather than 24-hour days. Thanks JR. Interesting idea, I suppose, but I’ve done enough reading on BY and his approach to learning/teaching that I’m not sure taking what he says at face value (without a lot of context and comparison to his other statements) is a road I personally am willing to follow. ReTx, I’ve done enough reading of and on BY that I’m sure I am not willing to take what he says at face value — at least not without a lot of context, comparison, and more. What we consider a “literal” reading is still highly interpretative and bears millennia of assumed and unspoken exegesis. I certainly don’t think the people who wrote them intended them to be read the way we do today. They probably were very aware of other flood stories when they composed the accounts about Noah and were in dialogue with them, like they were with the creation account in Genesis 1 and the Enuma Elish. The burden we place on these accounts with our insistence on taking them “literally” (ie accurate history) is not a burden they were intended to bear and we can miss out on the important things these writings have to teach us. When I left Mormonism 11 years ago, I believed in a literal Adam and Eve with some certainty, a global flood with significantly less certainty, and I did not believe that the earth was 6,000 years old (although I believed that the Fall happened 6,000 years ago). I believed in longer creation periods as opposed to literal 24-hour days. But I’m not sure what the consensus would have been among ward members–especially since the vibe of a ward can change a lot based on demographics. Most of the Mormons who I knew who were interested in having in-depth discussions about this stuff had nuanced views on these questions. Young earth creationism is something I haven’t heard much of at church except among the oldest church members, likely because anyone in their 50s or younger was taught evolution in school (including BYU). It takes a very stubborn sort of person devoted to ignorance of science to be a YEC in this day. It amazes me how much intellectual snobbery there is among those who try to uphold evolution and an old earth, while at the same time basically dismissing everything that the scriptures and the prophets have ever said. It has been said that the educated would never believe such foolishness as a young earth or a literal global flood. After all, it requires stubbornness to so willfully be ignorant regarding science. Of course, no one of any real intelligence would ever dare disagree with such learned people, and we all know that there are no errors that have ever been taught at BYU. Now, I have read some very good comments on this thread, and they are the ones that are asking questions, and I think they are questions that all those who claim a belief in evolution and all those theories and scientific assumptions need to ask themselves. So, let us run through it again. Was there a literal Adam and Eve? If there wasn’t than you also have to deny the fall, and thus you also deny the need for Christ and there is no need for an atonement, so there is no real need for religion at all. Now, one must distinguish between the age as measured from creation and age as measured from the Fall. To say it is thousands or millions of years old is meaningless without this clarification. To believe in a 6,000 years of mortal existence (meaning 6000 years of birth and death) is to believe the scriptures. To deny this is to deny all the scriptures, as they all teach this. Without the scriptures what is your knowledge of God based on, and how do you know you are right? Without this knowledge and understanding your faith is vain and cannot save you. On the other hand, if it is only 6000 years than evolution is impossible because it is dependent on billions of years. It could go on. The simple fact is that one may claim the religion, but if they are denying the very foundations on which that religion is built, than what good is that claim. But, more in line with the original tone of the blog, there is a large movement to deny the basic doctrine of the church, including Adam and Eve, the Flood and the age of the earth. And it has nothing to do with educational level. Rather, it has everything to do with the desire to appear educated, especially to the world. Within the last couple of months I attended a class in church where a man in his thirties discussed his experience studying anthropology at BYU, and specifically how he maintained his faith in spite of the schools teaching evolution, and that he separated the teachings of the world, based on worldly observations, from the teachings of the church, based on revelations. The clear implication was that evolution (not so much old-earthism) was incompatible with church doctrine. Several people spoke in agreement and no one (myself included) challenged it. This is typical of my experience among mormons, which is why I am quite fascinated to see several commenters (and the OP) question whether a significant number of people believe in evolution. I think we tend to underestimate peoples’ ability to maintain cognitive dissonance by holding contradictory beliefs. Now the OP is trying to ask if Southerton is making a straw man argument by claiming that mormons believe in YEC, a literal fall, and a world wide flood. I would have to say that it is not a straw man. Given D&C 76, past statements by church leaders, and teachings in the Institute Manuals (unless they have changed since I read them), I think it is a reasonable claim even if most mormons don’t really believe it. Similar to saying that Catholics don’t believe in birth control even though most of them use it. Another example: anyone that has traced their lineage back to Adam is exhibiting a belief in a literal fall and probably a worldwide flood as well. But that doesn’t mean that mormons (or even church leaders) do not believe in evolution. Elder Eyering and Elder Holland both have said things recently that indicate evolution is not incompatible with church doctrine as they see if (citation needed), although Holland made clear that a literal fall is a crucial aspect of doctrine. As documented in David O. McKay and The Rise of Modern Mormonism, I think it was shown that President McKay believed in evolution but declined to say so publicly because such a statement would have been interpreted as a revelation when he had no revelation on the subject. Years later, Bruce R. McConkie famoulsy named evolution one of the seven deadly heresies, for reasons echoed in the comments by John Robert and shematwater above, among others. So it is hard for me to see any kind of consensus among church leadership. Admittedly, my beliefs do not reflect typical mormon beliefs, but for my part, I think that the Bible does not teach young earth creationism, nor is it incompatible with evolution. Nor should we take everything in the Bible (or even D&C) literally. If we were to do so, we would believe that the sky is actually a firmament – a solid structure – holding up the waters that were separated from the earth, that rain falls when God opens of the windows of said structure, and we wouldn’t fly on airplanes or send satellites into space because they would crash into it. No, mormons are not biblical literalists. Nobody is, really. But many do tend to believe in a literal fall, and even a world wide flood. Those who hold those beliefs are in good company (McConkie, Joseph Fielding Smith, for example). Those who believe otherwise are also in good company (presumably David O. McKay, Henry Eyering, maybe Henry B. Eyering and Elder Holland, and pretty much all the science professors at BYU) but they are also pretty quiet about it, except in the bloggernacle. eek. I implied in my last paragraph that certain McKay, Holland and others my not believe in a literal fall… I have no reason to believe that. Should have referred to evolution of plants and non-human animals only. I don’t know what any of them think of evolution into humans. I believe that the resurrection was real, and that Mary was a virgin. I know that science isn’t on my side in these matters, but I don’t feel a need to reconcile faith and science. I feel that way about other scripture stories, too — they work better for me if I approach them as real. Rockwell, one of the reasons that person maintained faith in spite of his BYU anthropology classes is because BYU anthropology professors bend over backwards to make sure testimonies aren’t put in jeopardy. It was not unusual to hear from a professor at the beginning of the semester something like, “I have a temple recommend, and I personally have no problem reconciling evolution and the gospel. Some people do, though. If you are one of those people, then I’d much rather you not believe in evolution. You just need to learn about it to pass this class. It is not worth losing your testimony over.” I even had a physical anthropology professor devote an entire class period to fringe theories for the express purpose of giving people alternate scientific explanations that might sync better with their testimony. Needless to say, when I had a religion professor talk about the evil anthropology and biology professors trying to kill testimonies by teaching evolution, I was not happy. After college, I’ve had wardmembers react with surprise when I tell them I graduated from BYU in Anthropology and don’t have a problem with evolution. I really think a lot of people are YECs not because they’ve been convinced by the data, but because they grew up in the age of McConkie where it was a given and they just don’t care about the topic. (i.e., They’ve got bigger things to worry about.) I can think of several family members who fit that pattern. I have considered and reconsidered what it was that initially irritated me so much about Shem Atwater’s comments. It has turned out to be only partially a matter of my native negative reaction to authoritative tone and to apparently arrogant assertions of superior knowledge, whether they come from Darwinists or McConkie-ites, or any other manner of -ites who “know” all the evidence and/or, like Atwater, know “everything that the scriptures and the prophets have ever said”, and draw only ironclad, correct conclusions. My irritation turned out to be primarily his implicit assertion that because I don’t know or care whether there was a literal Adam and Eve, I cannot possibly have a testimony of my need for reconciliation to God or of Christ as Savior making that reconciliation possible. It seems he may have mixed up the question of whether there was a literal Adam and Eve and the question whether there were a singular Adam and a singular Eve and the question, if there were, when they “fell” with questions about the possibility of evolution/natural selection lying behind the creation/source/whatever of the bodies of any such Adam(s) and Eve(s). As I recall BRMcC’s argument (and that of certain BYU religion professors who have attempted to do battle with the biology and anthropology departments), mimicked here by Atwater, it included there being no death prior to the “fall” and therefore no natural selection of the fittest ultimately producing the bodies of Adam and Eve. Well, I also don’t know or care how the bodies of any Adam and Eve came about or whether there was such a thing as death before the “fall.” If there were no literal Adam and Eve, that would have no effect on my own “fall” from childhood innocence or on my weaknesses (or strengths) or illnesses or adversities or existence as a “natural man” who would prefer to be made a “new creature” in Christ. (2 Corinthians, Galatians, Mosiah) It would have no effect upon my need for atonement/reconciliation to God. It would have no effect on my spiritual witness/testimony of Christ as the Savior who can make that possible. I think I somehow resent being told that my witness is false because I do not insist upon a literal Adam and Eve. It smacks of the eye saying to the hand “I have no need of thee.” (1 Corinthians). I have known local church leaders and known of both local and general authority church leaders who have no difficulty reconciling evolution and the gospel, including some local leaders who do not believe there was a literal Adam and Eve. I find it strange that Atwater’s commitment to what he believes to be “the basic doctrine of the church” leads him to accuse such worthy local and general authority leaders of “desir[ing] to appear educated, especially to the world.” I would hope his testimony of and commitment to Christ is not dependent upon there being a literal Adam and Eve (and/or no death prior to their “fall”) as implied by his comment. What if it turned out that those understandings were incorrect? Thank you Shem Atwater for making it clear that strident voices exist. I just wish I knew if it was a majority of members like yourself, or a vocal minority. I’m hoping for the latter. Well, since my comments are discussed specifically, and by name, I guess I should reply. First, I spoke my mind, which is something that I am want to do, as some here can tell you. I don’t try to present a false sense of humility or couch my thoughts in terms that would take the strength of my convictions from my words. I use the language to the best of the ability that god has blessed me with to state what I know to be true, and to present what I have faith is true. It may sound arrogant to some, but at least it is not weak and without conviction. I would rather sound arrogant in my opinions than without conviction. As to what I said, I am fully aware than many people do not believe in a literal Adam, and yet still believe in God and Christ and the Atonement, and all that stuff. Despite this there is no logic behind it, and it is contradictory. The doctrine of the Atonement is dependent on the Fall. Without the fall there is no need for the Atonement. And note that I do not say an Atonement, but The Atonement, meaning the doctrine that the Church teaches regarding the mission of Christ in mortality. You can believe whatever you want, but there is only one revealed doctrine of the Atonement, and without the revealed doctrine of the Fall the Atonement is unnecessary. More to the point, if the fall did not happen than it is logical to assume that, while some may need an atonement, other may not, and thus the claim that all men are fallen and in need of redemption does not stand without the Fall of Adam. So, believe whatever you want. I do not question anyone’s personal conviction as to what they personally believe. What I question is a person’s convictions in the church and the scriptures when they are, at the same time, professing beliefs that outright contradict these things. In other words, I do not believe anyone’s claim in faith that Joseph Smith was a prophet who also denies the literalness of the story of Adam and Eve and the Fall. Joseph Smith declared this, as revelation from God, to be the true history of this Earth. To deny it is to deny that Joseph Smith spoke for God, and thus to deny that he was, in fact, a Prophet. The same goes with every prophet that ever lived. You cannot claim faith in a person as a prophet, or in a church as being from God, and at the same time deny what they teach. It is illogical and hypocritical. For those who say they simply don’t know, fine. They have time to learn the truth and conform to it. Blessed are the humble. I might add, truly humble, rather than false humble. But at least you’re honest about your lack of humility. God didn’t bless you to be arrogant. Don’t blame your lack of humility on God. That is an affront to God. I frankly think God would be embarrassed that you seem to be taking his name in vain with this false blessing of language. Once again, blessed are the TRULY humble. Blessed are the meek. Perhaps it would be a good time to re-read the Sermon on the Mount. I’d argue that it isn’t contradictory but rather it is paradoxical. For me, I find God in the paradoxes. More specifically, I find God while trying and failing to resolve the paradoxes. I think this is because confronting paradoxes forces me to accept that the Gods and Their truth is much larger than I am capable of understanding – perhaps putting me in a place where I can experience my genuine relationship to Them. Yes, blessed are the humble. However, it is not blessed to give a false sense of humility in order to appease your own pride. I think people today confuse the terms. I am not proud, nor am I truly arrogant. I do not pretend or claim any superior knowledge, understanding, or rights than anyone else. But God has blessed me, as he has others, with an ability in language, and to deny it is to present a false humility. Humility is not to deny one’s own ability, but to admit one limitations and be willing to seek help and understanding from those who are blessed in the things which you are limited. I really don’t think that arrogance or humility can truly be gauged in anyone based solely on internet blogs, as you are unable to see how they interact with others and how they treat others. As to the contradictions I mention, it is not just me that says it, but the leaders of the church and the scriptures say it as well. The whole premise of non-literal interpretation is an effort to alter the understanding of the scriptures in an attempt to eliminate said contradictions. Those who don’t believe the Bible is literal history are admitting that what they believe is contradictory to believing biblical literalism. As such they are also admitting that any doctrine that is based on Biblical literalism, such as the Fall, the Atonement, the age of the Earth, and the Universal Flood, are contradictory to what they believe. Pointing out this fact is not arrogant, and it doesn’t matter how offended people are by it. It is simply true. Deal with it. The doctrine of the Church of Jesus Christ of Latter Day Saints, in its entirety, is dependent on scriptural literalism. To say you do not believe the scriptures to be literal is to thus contradict that doctrine. You may have reconciled your view of the scriptures with your view of science, but you have not reconciled the doctrine of the church, as you have no power or authority to alter it, and thus you are only left with the contradiction. You can resent what I say all you want. That is your right. But it doesn’t change the fact that a claim of belief in two contradictory ideas is not a claim that can be trusted. Would you trust a man who said that adultery was evil, but that if two people really loved each other than he didn’t considered their act to be adulterous? What of a claim that racism is evil, and yet praising the KKK for their work in the community. It is the same with church. When one claims to believe the church and its doctrine, and then claims to believe in theories that outright contradict those doctrines, their claims carry no weight. Now, as I said, I make no statement regarding your personal beliefs. Believe what you will. But when you make statements like these I cannot see how you are actually believing the doctrine of the church. It’s not contradictory at all. We are demonstrably imperfect beings, constantly tempted to selfish acts at the expense of others. Whether that’s the result of a literal Fall or not, we are all still fallen – “for all have sinned, and come short of the glory of God.” Our Heavenly Parents being perfect, eternal beings, the Atonement (The Atonement) is still necessary to reconcile us to them and allow us to “grow up” to be like them. My personal jury is still out on questions like the point at which spirit children of our Heavenly Parents began to inhabit human bodies on earth, or whether there was a singular Adam and a singular Eve. However, if we take it as truth that God is not a liar, then the earth, and human inhabitation thereof, are far older than 6,000 years. Believing those two things – a young earth and a truthful God – would truly be contradictory. To clarify, the argument you are assigning me isn’t really the one I am making. You said, “it doesn’t change the fact that a claim of belief in two contradictory ideas is not a claim that can be trusted.” My belief (or my faith) isn’t so much in the contradictory ideas themselves. My belief or faith is in Deity that is much bigger than the human mind can imagine. The two contradictory ideas are two small puzzle pieces in a million piece picture. I don’t find it surprising or upsetting when we mere humans can’t make everything align. But the process of trying to make them align is coming to know God (for me at least). I find doctrine interesting and useful and fun. But it’s a secondary usefulness in that it directs us to Christ but isn’t Christ himself. What truly matters is our individual relationship with Jesus Christ and reliance on his Grace. Please point out where God has ever declared the earth to be more than 6,000 years old, speaking of course of the time from the Fall of Adam to the present. God has declared that this earth will have a seven thousand your mortal life. That is recorded in the scriptures. Please show me a reference what God declares anything different. God is not a liar, and everything that God has revealed has manifested the literalness of Adam and Eve, the Fall, the young age of the mortal earth, and the global flood. Show me anywhere in the scriptures that any one of these things is not literally true. I have two problems with your statement. First, we can’t make things align. 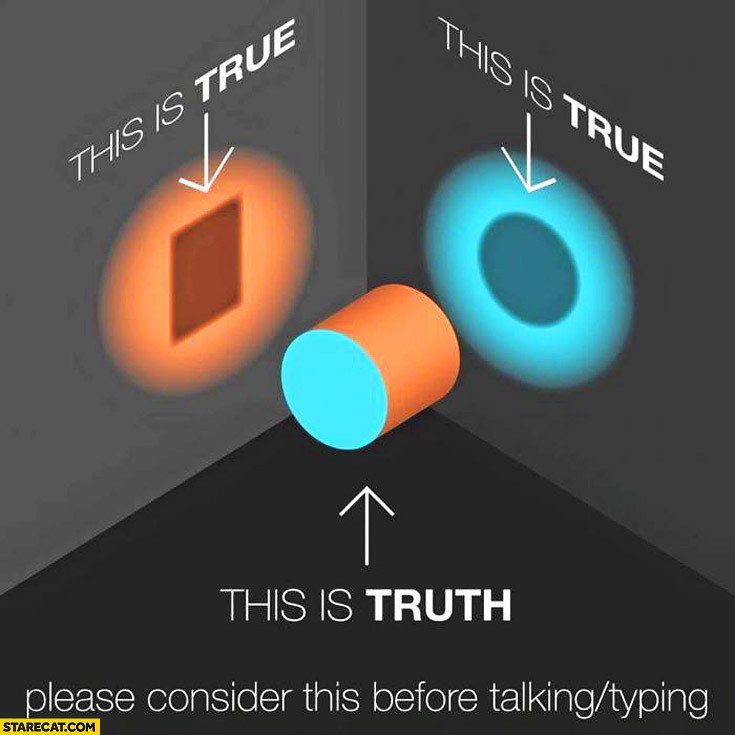 Truth is truth, and if something does not align with truth we cannot make it align. We can construct our own theories and thus make things align, but in the end those are nothing. As to what you say regarding doctrine, it makes no sense. Do believe that Christ is the Son of God? That is a doctrine. Do you believe He lived in mortality? That is a doctrine. Do you believe He suffered and died for our sins? That is a doctrine. You can’t know Christ and not know and believe the doctrine. You say that what truly matters is our relationship with Christ, but we can’t have a relationship with Christ if we do not have the true doctrine of Christ that allows us to know and understand Him. We can’t have faith in something that we don’t know. Many will say to me in that day, Lord, Lord, have we not “BLESSED ME WITH AN ABILITY TO LANGUAGE? and in thy name have FALSE HUMILITY? and in thy name done many wonderful works? 23 And then will I profess unto them, I never knew you: depart from me, ye that SPEAK iniquity. I think we have different definitions for the word ‘know.’ I have Buddhist friends that know Christ very, very well. They don’t use the same language nor have the same doctrines, but that has nothing to do with their connection to divinity. Frankly, I have religious envy for many other faith traditions because they connect so beautifully to God in a way I can’t seem to manage. My definition of ‘know’ is based much less on what one knows ‘about’ Christ and much more about what is built of him in the human heart. I’m not asking you to accept anything I say. I recognize you see it according to your own spirituality and lived experiences. I have no bones with that. I’d be curious how big of a literalist that you are. The Genesis account says that God created the earth in 6 DAYS. Do you literally believe it was 6 days, as in six 24 hour periods? Because that’s what Genesis says, and if you are arguing a day is 1000 years, well that’s not what Genesis says, it says six days. There are many of us who can be faithful to God and square that faith with scientific evidence. Admittedly, that is difficult to do if one’s faith hinges on the literalness of some of the stories from an Iron Age society, but I reject such a requirement. Jesus’ disciples didn’t grasp what he was up to because their minds were seeing everything through the lens of 1st century Judaism. It was only after he revealed himself through his resurrection that they began to grasp some measure of what had occurred. Still, even afterward they struggled at times. For example, there was the argument over whether Gentile converts had to live abide by the covenant of Abraham and get circumcised. Remember, the scriptures they had available required circumcision as part of the covenant with God and no scripture had countermanded it. Was it still a requirement? Ultimately, it was decided that it wasn’t, but it took viewing those scriptures differently (not literally) in order to do so. It’s what allowed Paul to make the argument that both Gentiles and Jews had to be “circumcised in the heart”. That is a non-literal view and yet still one that builds faith to salvation. Perhaps you can make a bit of room for us non-literal believers? I have been reminded that at least the Collins English Dictionary includes the following definition of “appendix”: “any part that is dependent or supplementary in nature or function; appendage”. I’ve also been reminded that Joseph Smith declared: “The fundamental principles of our religion are the testimony of the Apostles and Prophets, concerning Jesus Christ, that He died, was buried, and rose again the third day, and ascended into heaven; and all other things which pertain to our religion are only appendages to it.” The suggestion has been made that while the traditional understanding of the fall of Adam includes its necessitating the Atonement, the Atonement might well be necessary even if that traditional understanding of the Fall were a mere supplementary “appendage” to our religion — useless to some who find sufficient evidence and experience of fallen human nature regardless of the literal, figurative, mythical, or archetypal nature of the received Adam and Eve story, but potentially helpful to others’ faith and understanding. Many years ago my appendix was not only useless but life threatening. I’ve done quite well without it. The difference in beliefs about Adam and Eve reminds me of differing reactions to the thought that Job may have been fictional rather than a real person. For some that possibility would take all the power and force out of D&C 121:10; for others it is irrelevant to the meaning and effect of either that verse or the Book of Job. I cannot find it necessary or appropriate to challenge the faith of those who believe or disbelieve in a literal Adam, Eve, or Job. One of our Articles of Faith declares that the first principle of the gospel is “faith in the Lord Jesus Christ” — not faith in the Church or its doctrine, the infallibility of prophets or our understandings of their words, or our own attempted logical extrapolations from some of our beliefs or doctrines to others. I don’t know whether to be pleased or saddened by the discussion here that has seemed to have been prompted by my musings on my personal reaction to Atwater’s comments or his rhetorical style. And yes, to some extent I have some envy of some other religions. That does not mean that they have any power to bring me closer to God in any way what so ever. God has declared that only through His gospel and His priesthood can anyone know Him (D&C 84: 19). People can live great lives, and they can be great men and women, but no one outside God’s church can truly know Him. God has spoken it. The Hebrew word that is translated as Day in Genesis is also translated as season in other places in the Bible. The term does not only mean a 24 hour period, but can also reference an unspecified period of time, such as an age or era. As such I can take the Genesis account literally, to mean there were seven set periods of creation that the gods progressed through to bring about this world. And yes, I take that very literally. I also take literally Lehi’s statement that if there had been no fall “all things which were created must have remained in the same state in which they were after they were created” (2 Nephi 2: 22). All things existed in an unchanging state. It doesn’t matter how long they existed like this. For all I know Adam and Eve could have been in the Garden for 4.5 billion years. But it is a moot point, because there was no change after creation ended. There was no birth, and there was no death. The question of Circumcision was not settled by altering the meaning of scripture. It was settled through revelation given by God to the one man He had ordained to the purpose; namely Peter. They didn’t change the way they viewed scripture, they simply allowed God to reveal new commands and requirements as He saw fit. God has done this from the beginning, and will continue to do so. As to making room, I never said there wasn’t room. I know many members of the church who believe in these things, and they are welcome to remain. I do not think such opinions are cause for any action against them, nor will I shun them in any way. I will still tell them they are wrong, and I will continue to teach and advocate faith in the things that God has revealed, without the need for us to alter their meaning to fit with doctrine’s of men. And I will always pray that everyone come to a knowledge of the truth and accepts it. I do not say what I do simply to argue, but because I truly believe that such ideas and opinions are dangerous to the souls of men, and I fear that those who espouse are putting there eternal progression at risk. Now, I could be wrong, and if I am than praise God for it. But until God, or His ordained prophets declare it so I will continue to try and reason with men over those things that I feel will effect our eternal destiny. I guess that when Joseph gave God the credit for his ability to interpret dreams he was just being arrogant and taking the Lord’s name in vein. Or Daniel, when he gave God the credit for his wisdom and understanding, that was just misusing the Lord’s name. I guess both Joseph and Daniel are condemned by your reasoning. Maybe you should tell me who I should credit for the talents I have been blessed with. Maybe I should simply glory in myself and say that God had nothing to do with it, but I am simply naturally good with language? Maybe I should credit my genetics, saying that it is just a natural result of Evolution that a person could be born with an ability in language? Truly, tell me who should get the credit for such a blessing. Obviously praising God for our talents and abilities is to misuse His name, so there must be someone or something else that should get the credit. I think you need to read again Acts 15. There is no revelation on the matter and it was James who ultimately decided it. The council simply interpreted scripture. I get that you want to accept every scripture as if it literally came from God’s lips and believe that there is no ambiguity in how scriptures are understood, but not everyone sees it that way, so for you to wave around that your perspective is Truth and imply that everyone else is amiss in their understanding is complete hubris. While not advocating the shunning of people who do not take these things literally, your attitude of dismissing their ideas as error and advocating of yours as the Truth and Only Way to Understand These Things has the effect of creating an environment of dogmatism that pushes people away. You’re the guy in Sunday School class who speaks Truth against those who do not have literal views. Some of us see a lot of ambiguity in scripture and the proclamations of leaders, who have been wrong on many occasions, despite claiming that they knew the mind of God. They are not doctrinally infallible and have a track record demonstrating that fact, so some of us don’t view things as settled as do you. When you proclaim your view as the only Truth, and declare that we’re putting our and other’s souls at risk, it has the effect of pushing us away. In your ignorant hubris you shrink the boundaries of the church and make it less welcoming to those who are less dogmatic about things for which there is zero falsifiable evidence. While I do not begrudge you your views, please don’t beat us over the head with them or imply that we are less faithful/valiant/etc. Shematwater: “Please point out where God has ever declared the earth to be more than 6,000 years old” Please point out a single instance of God ever declaring anything directly without human intervention. The glory of God is intelligence, not ignoramuses bullying others with poorly informed statements. The means by which we understand how old the earth is are scientific and based on evidence and investigation. Pronouncements by millenia-old agrarians about what God did or didn’t say are not on par with evidence and scientific method. Whenever religion faces off with science in an area that is in science’s purview, religion invariably loses. Fortunately, our church doesn’t ask us to undertake such foolish endeavors. There are no Young Earth Creationists in the science department at BYU. There are no biology professors at BYU arguing against Darwin either. Pronouncements by millenia-old agrarians about what God did or didn’t say are not on par with evidence and scientific method. Succinctly put as usual. God did not write Genesis. Moses didn’t either; it was written down centuries later from oral tradition, and represents the best efforts of a primitive people to explain what was, for them, unexplainable and beyond their ken. Treating the Bible as if God were the literal author of every word is the egregious error of a particular brand of Protestant, and not really in keeping with the truth-seeking tradition of Mormonism. In addition, it’s not anywhere stated, it’s merely been assumed for centuries by people who didn’t have anything else to hang their hats on, and couldn’t bear uncertainty and dissent. Shem, the ASSumption that you are good with language is yours, not God’s. (Do you claim a revelation where God said you’re good with language? I’d say your good at offensive language but not spiritual language.). You are good at hubris, arrogance, but those are qualities of the devil, not God. You should attribute those attributes to the Evil One, rather than falsely blame God for your lack of humility. That’s taking God’s name in vain. By the way Shem, are you going to correct Elder Holland? His statement that clearly contradicts your position. I am actually very good with language, and every test and evaluation I have ever taken is sufficient evidence for me to make that claim. You may not like my style or use of the language, but that is not the same thing as my ability. So again, I credit God for my abilities in language, which I know to be very good. However, I will take full responsibility for the manner in which I choose to use the blessing that God has so graciously given me. In other words, what ever you accept as truth has to be what God intended us to accept. Again, we go back to the intellectual snobbishness that you and many others have displayed in your comments. Not only do you know more about God than His appointed and ordained servants, but you have been able to discover God through science, rather than through revelation, something that God has stated to be impossible. Believe what you want. I couldn’t care less. But in the end you are putting your trust in the science of men and trying to claim it as the truth of God. You have stated that you have no real faith in the prophets, and dismiss revelation out of hand. You speak of religion as if it is just another area of study and has no baring on anything else. But God is God, and no amount of man’s science will ever make it otherwise. God has called prophets and has spoken through them, and it doesn’t matter how much you and others rail against them, for they will stand with Christ in the last days to declare that all that they have said is true. So, believe what you want, but unless you accept the truth of God’s gospel and conform your life to it, you cannot claim the blessings that have been promised. I like the joke. I had to laugh a little, and I might just use it myself sometime. But what you are claiming is that there is no revealed truth. If that be the case than religion is pointless and always has been. So, who cares what the Bible means, as it is just the ramblings of ignorant ancients who lacked the intelligence to understand the world around them; unlike we in the modern world who have clearly evolved beyond such foolishness. If you are going to make this argument than what does it matter what I say or believe. God himself is meaningless, as everyone can just make up their own doctrines and call it truth, for there is no true standard by which to measure. 2 Nephi 2:17 includes an interesting phrase: “And I, Lehi … must needs suppose that …”. I wonder how much of what follows (including the “same state” statement) was Lehi’s “supposing” in the context of his culture and his attempt to reason with his sons and motivate them to action. As there is plenty of speculation and supposing to be found in the speeches of Brigham Young and some in Joseph Smith and plenty in Joseph F. Smith and Joseph Fielding Smith and Bruce R. McConkie and many others (in addition to what I’m doing right now), I have not yet found a really good reason to suppose that there was no supposing going on in Lehi’s words or Nephi’s record of them or even in the Book of Mormon translation process. The inclusion of any such supposing doesn’t make the Book of Mormon any less “the most correct of any book on earth [as to] a man [getting] nearer to God by abiding by its precepts, than by any other book.” Or maybe Joseph, not having read and critiqued all books then on earth, was himself supposing or indulging in hyperbole. I don’t suppose Shem has been called of God to call to repentance those he identifies as hypocrites, illogical, intellectual snobs, or merely wishing to appear educated in the eyes of world. If he were and were blessed with any unusual positive ability with language, I suppose God might also have blessed him with a sense of tone or style conducive to motivating some such change. Shem, how are your kids? I hope they are getting enough of your attention. It may be wasted here. p.s. Yes, I am aware of the definitions of “suppose” in Webster’s 1828 dictionary and others including a possible meaning of the word that runs counter to my supposing that Lehi’s speech may include supposing. But I don’t suppose that makes any difference if Lehi was human. shematwater, you seem to believe that there can only be a single literal interpretation of the scriptures, your interpretation. For me, and probably others here as well, that’s the most concerning issue I have with your statements and that’s why you come across as so arrogant. Many people believe the scriptures to be literal but still have differing interpretations of the scriptures. Out of curiosity, according to your literal interpretation of the scriptures, do the creation narratives describe a single physical creation, like what Joseph Fielding Smith taught, or do the creation narratives describe a dual spiritual/physical creation, like what Joseph F. Smith taught? Many who adhere to a literal interpretation also accept parts of the scriptures, including the creation narratives, to be figurative. For example, was Eve literally created from Adam’s rib, or was that just figurative as so many of our prophets have taught? If we accept that even one part of that narrative is figurative, shouldn’t we be open to other figurative interpretations as possibilities as well? Our doctrine is based on the acceptance of new and continual revelation and knowledge which challenges past and current understanding. That’s as true for us today as it was with Joseph Smith. We must be willing to accept that how we interpret and understand the scriptures and the gospel today may and will inevitably change over time and thus our scriptural interpretations must be flexible. That is one of the hallmarks of our religion. To believe otherwise is decidedly unmormon. The most recent line of discussion reminds me of a discussion ten years ago on the old Mormon Matters site about white shirts for men as the only acceptable attire for church. It went on for quite awhile until the instigator admitted he was just pulling our collective legs. This is so rich, as if poor Shem who admits he comes across as arrogant is somehow not guilty of “intellectual snobbery”, or in other words “I’m right and you all are wrong”, while at the same time not addressing Elder Holland’s statement clearly contradicting his views. Here are some other things prophets and apostles have said that allow evolution is compatible with the LDS gospel. Am I talking to a teenager? I haven’t heard anyone over the age of 30 discuss tests they have taken, especially language tests. You may well be able to use proper grammar and punctuation, but that hardly makes you a good communicator, especially with regards to persuasion. I’d say your powers of persuasion on this topic deserve an F.
Shem, really, I’m done picking on you. You certainly hold yourself in high regard, that is clear. Language and powers of persuasion are 2 different things (perhaps polar opposites in your case.) Don’t let your ego about language cloud your judgment when it comes to persuading others to your point of view, and check your ego at the door. (Did your grandmother tell you that you are good with language, or was it your SAT scores?) Accusing others of intellectual snobbery while ignoring it in yourself is bound to raise hackles. Accusing others of “dismissing the prophets” is clearly something you are extremely guilty of. Believe in a literal Bible if you will, but cut the self-congratulatory snobbery on your language ability. If you want to claim the high ground when it comes to snobbery you need to cut down on accusatory and arrogant rhetoric in yourself. Shem: “You speak of religion as if it is just another area of study and has no baring on anything else.” That should say “bearing,” not “baring.” Homonyms are hard. The word used for “day” in Hebrew is exactly the equivalent of the English “day” (therefore it could be a 24-hour day or it could be “era” as “in my day”). I just did a quick google search for “How old is the earth?” and it told me 4.5 billion years. What’s a billion or two among friends? For sake of argument, let’s say Google underestimates the earth and it is actually 6 billion years old. Are you willing to say that an era could be a billion years, and that these 6 days/eras are closer to 6 billion years (or perhaps 4.5 billion)? Just curious. Would it be possible that all this creation took that long, and that Adam & Eve are homo sapiens from 200,000 years ago (as Wikipedia says–you know the source of all internet knowledge)? For me, the story of Adam and Eve is about a people who developed enough language to be able to name animals and each other. Eventually, they evolved enough to know right from wrong. They questioned whether that was progress. Awareness and consciousness brought the ability to feel remorse, guilt, and shame. Language, awareness, and consciousness allowed Man to see himself as separate from other life forms. I believe spiritual relationships with God are supposed to be about internal growth that leads to external changes. Progress is measured through how we treat others. When, people get caught up in the stories and take them literally, personal growth stalls and the aggressive nature of people is more evident. Too often this is used as an excuse to do violent things. A metaphorical approach to scriptures might being safer for societies. It is hard to defend killing and maiming to protect metaphorical stories. It has been a while since I posted here, so to get caught up I thought I would post single comments to individuals, rather than one to everyone. I apologize for the length, but I had a lot to catch up on. True, but you seem to be so focused on the word ‘suppose’ that you miss the word ‘must.’ Lehi is not saying that this is his personal musing, but rather that since he accepted the words of the prophets to be true that there is inevitable conclusion that must also be accepted. Regardless of how much of his words you want to apply this to (which is very few actually) it changes nothing. He is making the exact same argument I am, just in regards to only one particular doctrine. If we accept the ancient prophets as prophets who spoke for God, than we must suppose that Adam and Eve were literal people, that the Fall happened, etc. Actually I am, as are all those who hold the priesthood. In section 20 of the Doctrine and Covenants (verse 42) we read that it is the duty of elders to “teach, expound, exhort, baptize, and watch over the church” What does it mean to exhort? It means “to urge, advise, or caution earnestly; admonish urgently” or “to give urgent advice, recommendations, or warnings.” (Dictionary.com) So, this is me giving urgent warning to the members of the church about something that I believe is very dangerous, which is my duty as an Elder. And regardless of my style of writing or opinions, I have not yet stooped to personal attacks; unlike you who feel the need to insinuate that I have to be a bad parent to be commenting on this blog. So, there is that. Yes, but once again it is a pointless matter. Creation may have taken 100,000 billion years, but once creation had ended (and it did end) nothing ever changed again until after the Fall. The time before the fall is irrelevant. No, because the scriptures tell us that Adam and Eve lived approximately 6,000 years ago, and that no one lived before that time, and that there was no birth or death before that time. But that is not what I am advocating, and never was. I am saying that the prophets have told us the correct interpretation, as revealed by God. I take no credit for the knowledge, nor do I claim it as my opinion. I claim it as Moses’ opinion, and Abraham’s, and Peter’s, and Paul’s, and Joseph Smith’s, and all the modern prophets. Now, you may claim that I can’t know Moses’ opinion, or any of the ancients. That is fine, but I can know the opinion of modern leaders, and all of them have testified that Adam and Eve were real people, that the Fall happened, etc. They may have differences of opinion regarding those things not revealed to us, but they do not vary on the meaning of what is stated in the scriptures regarding these things. I am not advocating that people follow me, but that they follow the prophets. When people begin to ignore the prophets in favor of secular theories I see danger, and I try to warn against it. As to your other comments, you would need to provide reference to the Presidents so that I could understand exactly what you are talking about. As far as I know the accounts only describe the physical creation, but acknowledge that a spiritual one had taken place earlier, but I could not compare this to the words of the prophets without knowing what those words were. I have to disagree here, to some extent. Our person opinions must be flexible and able to change as new truths are revealed, yes. But the gospel does not change, nor does the word of God. Doctrine is eternal and unchanging. If it was not so we could not have faith in God. Our religion is not based on ever changing doctrine and scriptural interpretation. It is based on continuing revelation that enhances what has already been revealed and enlarges our understanding, but it doesn’t change it. While you’re certainly dogmatic in your opinions, it seems there is a bit more flexibility in your position than you first seemed to let on. I will be posting an interview with Dr. Ugo Perego and his beliefs, as well as the official church position, about evolution in about a week. I hope you tune in. I”d like to see if you agree with Dr. Perego. Shem, Sorry you felt there was a personal attack. None was intended by me. There is at least one way to read my comment as intended, not being a personal attack, but I can now also see how you could take it that way. On the other hand, I am surprised that you seem to think your denigrations of others here as hypocrites and as intellecutal snobs desiring to appear educated in the eyes of the world were not personal attacks. Peace. The last person’s comments that I want to address are MH, but I would like to say a few things first. My first comment was a bit of a rant. I am frequently offended by the insinuations that only the foolish, ignorant, and uneducated would ever hold beliefs as I do. It is an arrogant, condescending, and snobbish attitude, and I counted half a dozen people who had expressed such opinions. In my frustrations I ranted a little about that attitude. My comment offended some, which offense they made known. In response to this I posted a second comment, in which I attempted to explain some of the reasons why I had chosen the wording and style I did. As part of that explanation I made the following statement. I am not sure why, but making this statement seemed to be highly offensive to MH and sparked a continual onslaught of personal attacks and accusations from him. Now please note that I made no claims to great ability or skill in language here. Nor did I imply such. I merely stated that I was trying to use what ability I had in the best way that I could, and I gave God the credit for me having the ability in the first place. In all I have made three comments regarding my ability. The first I have given. After being accused of arrogance, a lack of humility, and taking the name of God in vein, I made the following statement. This may imply a somewhat better than average ability, but nothing more. Truly the ability to communicate at all is a great blessing, for which I am thankful. But rather than simply taking this as it was intended it only sparked a new attack from MH, in which he effectively told me I condemned to hell for saying it. After a few more exchanges in which the personal assault persisted, I replied in frustration and annoyance and said the following. So, here I finally make a direct claim to higher ability in language than the average person. I still make no claim to be the greatest, or even among the greatest. I say simply that I am very good with language, and if you want proof I can provide a number of evaluations and tests as evidence. Truly, this was said more with the hope of shutting down the whole thing, but that was too much to hope for. MH again came back with a new retinue of assaults against me, questioning my maturity, degrading the evidence offered, and in general doing nothing except trying to vilify me as much as he could. I make this post, not in reply to him, but in defense of myself. I have, from the beginning, tried to be polite and did my best to stay away from making person comments, especially of a negative variety. But MH has done nothing but spew attack after attack, targeting anything he could twist into a target. He finally concluded that he had had enough of these jabs and personal insults, as he was tiring of them, but not until he had accused me of “self-congratulatory snobbery on [my] language ability.” But, as anyone who actually read what I wrote can plainly see, I made no great claims as to my abilities, nor did I hold them up as being greater than anyone else. Rather, MH has twisted my words in order to launch his personal attacks. I make no claim as to why, but I do feel the need to defend myself in face of such an onslaught. I will here briefly address some quotes that were given earlier. I am in completely agreement with this statement, except in the fact that I do not think the scriptural account could include evolution. If it turns out to be true I will not be sorely disappointed however. It doesn’t matter that much to me. But this does not even come close to addressing the issue. Evolution, as much as I disagree with it, doesn’t matter. What matters is people altering the words of prophets so as to make it easier for them to except secular theories. If it was just a question of evolution I likely would not have commented. But the issue was much broader than that. Great; I never claimed otherwise. But again this is trying to limit a much broader discussion. Does the church have an official position on Evolution? No, and that doesn’t bother me. But the church does have an official position on Adam and Eve, the Fall, the Flood, and the age of the mortal earth. It is not a question of personal opinion regarding something that we have no revealed truth about. It is a question of whether or not people accept what we do have revealed truth about. Notice that he says scientists can speculate and that those speculations don’t bother him. I agree, and I have never said otherwise. What bothers me, or more worries me, is when people use those speculation to rationalize away the words of the prophets, or hold them up as superior to the revealed word of God, which I think those being quoted would agree with. Great Quote; what does it have to do with the issue at hand? Again, great quote, but what is the point. I never denied that God works through the laws of nature. That I something I frequently tell people of other faiths and I have spoken of it in church. But again, the issue isn’t whether or not God used natural law. The issue is whether we will believe secular scientists more than God’s prophets as to what Natural Law is? If I am able at the time I will stop in, but my situation is in flux right now, so we’ll see. They were not personal because I made no direct comment to any person. I gave my opinion regarding a particular philosophy and on a general trend that I had seen in people’s comments. I did not single out any person, nor did I make any comment regarding their ability or their actions. I understand that some people take this personally. I do myself at times. But this kind of criticism is not the same as things such as “You must be…” When people said they resented my opinions, I was very careful not to say “That is how I see your opinion…” but rather, this is how I see the particular argument you are presenting at this time. Now, I may not have done this as well as I thought, but it is always my intention and desire to keep discourses of this nature to such phrases and style as this. And thank you for the apology. I can see how it was not intended as a personal attack. I need to make a notice and correction above. In my posted defense of my comments I opened with an indication that I would be directly addressing MH and some of the comments he had more recently made. When I started typing that post I had every intention of doing so. However, as he expressed his desire to leave it alone, and I feel that prolonging it would not be productive, I will not be doing so. Please ignore that implication, as I simply forgot to erase it from my comment before I posted it. Along those line I would also like to say that I have noticed several errors in spelling, as well as missing words, or the wrong word used in a number of my comments. If this offends anyone I apologize. Typing these things fast and without spell checking available, some errors are bound to creep it. Shematwater – you seem to be on your own. Shem, you seem completely self-unaware. You point out motes in others (intellectual snobbery), and can’t see the beam in your own eye (arrogance.) It is so evident to an outsider, but strangely absent from your self-perception. Truly this is the pot calling the kettle black. I was simply pointing out your beams to you (not in the kindest way, but it didn’t seem to bother you when you knew you were arrogant, so I assumed you had a thick skin) and you are still oblivious to how your own rhetoric played a role in devolving the conversation into “style” (your kind words for yourself) vs “personal attacks” (your words for me.) To be consistent, why didn’t you simply say you didn’t like my style of writing? Oh yeah, that’s your rhetorical flourish to denigrate me while defending yourself as somehow above reproach. I hope you become more self-aware of how your comments can be interpreted by others as attacks on them, and why people like me become a little hostile to you for your poor attempts to communicate with arrogance. Please work on your humility when your comment, and quit broadcasting your “ability to communicate.” I think that is a liability in conversations. Certainly that language you used was seen as boasting, yet you somehow lessened the impact by “here I finally make a direct claim to higher ability in language than the average person” as if it is still not a boastful statement. That’s a beam you still fail to see. (I learned in the 5th grade not to use this language. Not sure why this lesson hasn’t been learned by you.) Language like this and sounds boastful and should be avoided at all costs on blogs, IMO. Allow others to disagree with you without denigrating them as failing to “follow the prophets.” I think there is much more wiggle-room in your position, which you did seem to acknowledge than your original comments seemed to imply. But yes I’m done with this sidetrack. In conclusion, I think your etiquette could be improved and if it is improved, will not merit me pointing out your poor etiquette (or beams in your eye) anymore in the future. I’m unsure whether I should feel sorry for shem or just annoyed by him. Perhaps he truly feels that he is either not able or not allowed to have his own opinion about the scriptures or perhaps he feels that personal inspiration and interpretation are reserved solely for the general authorities. On the other hand, perhaps he is just self righteous about his own acceptance of what he thinks is the established doctrine of the church. Either way, my advice to him and to anyone else like him is to read a little more. You can even just stick with the scriptures, church publications, and writings of general authorities. The scriptures are far deeper than what is routinely taught in church and reading church and general authority publications, past and present, will show you that there are varying opinions from the prophets and apostles about the interpretation of the scriptures and the gospel. And that’s ok. Joseph Smith taught that our church does not have a creed, that we do not have a set, firm doctrine and this is still true for the church today. Also, gospel and doctrine are not synonymous. The gospel is unchanging, but our doctrine, how we understand, teach, and apply the gospel, does and will continue to change. I am actually fairly well read, though not as well read as I would like. I have my own opinions about many things, and I see no problem in this. You are simply refusing to understand what I am saying. Truth is truth; it cannot be changed and our private opinions do not matter in the slightest in regards to it. So the question becomes, how do we know truth? How do we learn that unchanging base of knowledge on which to build the foundation of our opinions? I believe that truth is found in the scriptures, as we are lead by the spirit. I also believe it is found in the words of the Prophets as they speak through the spirit to reveal to us the truth and the will of God. Once we accept these things we have our foundation from which our opinions on things can be based and can flourish. As God reveals additional truths and knowledge our opinions change to conform to that newly revealed truth. But as soon as we take away that foundation, than our opinions have nothing on which they stand, and thus enter a constant state of flux, changing with every wind of doctrine that is blown from any source that cares to spout a theory. You say the gospel is unchanging, and yet the doctrine does change. What is the doctrine but the statements of belief that describe the gospel. The gospel is a collection of core doctrines that define the truth and create our foundation. You say that the doctrine of the church changes, but if it did than we would have no foundation on which to base our faith. Doctrine must remain unchanging for faith to exist. Our practices may change, and how we implement the doctrine in our lives may change, but the underlying truth on which our practices are based must remain the same. Otherwise we could have no confidence that anything is true. So, again, what is your foundation of truth, and how do you learn what is true and unchanging? Until you can define that than what difference does it make what you believe today, as it could simply change by tomorrow. Now, I have a foundation of truth that all my opinions are based on. That foundation is the doctrine that has been taught since the days of Adam, and is now taught very clearly and directly in the Church of Jesus Christ of Latter Day Saints. That is my foundation, and I will not leave it for the uncertainty that is being proscribed in this discussion. I will also do my best to try and call people back to the foundation and out of the churning sea that perceive surrounding us. If that offends you I am sorry. I truly a sorry for anyone who would think to replace such a sure foundation with the shifting theories and philosophies that are so popular today. I believe truth is much larger than the human experience. Truth is ultimately a celestial matter and we are mortal creatures who are only capable of understanding our world based on mortal senses. I include the writers of the bible and the modern prophets in this. We are all a bunch of humans muddling through our lives, trying our best to make sense of then unknowable. We do that a good lot of times by creating stories. I believe there can be Celestial truths in these stories. But the stories are vehicles, not the Celestial truths themselves. Faith to me is a willingness to keep investigating the mysteries (and making choices in our lives based on our investigations) knowing very well we will never find the hard answers. Instead we create a relationship with God. So, because we are so incapable of understanding we can have no real confidence in anything as being true, as our understanding is constantly in flux. This is not a foundation, but a claim that such a foundation is truly impossible because we are incapable of grasping such an idea to begin with. But what God? That is my point. If we have no foundation of truth, or if, as you claim, we are incapable of actually knowing truth, than how can we have any real confidence that the one we are creating a relationship with is God? How can you even have confidence that there is a God to have a relationship with? Shem, how are you so certain your definition of truth is correct at all? Why should anyone believe you have a monopoly on the foundation of truth? Joseph Smith said that all religions appeal to the Bible, so that doesn’t seem to be a very good standard. You’re being overly dogmatic here, and once again asserting that you have all truth. This is not going to end well if you continue your dogmatic assertions. Please politely disagree and allow that others don’t need to accept all your assumptions, or I’m going to bring my hammer back. You seriously have no etiquette on the blog. I wouldn’t disagree with this. The goal is to let go of the need for a foundation. It’s standing on the edge of a cliff, looking at the depths and trusting that when you step out Christ will provide a step you can’t see or understand. Here is faith. “If we have no foundation of truth, or if, as you claim, we are incapable of actually knowing truth, than how can we have any real confidence that the one we are creating a relationship with is God? Which parts of the creation narratives are literal and which are figurative? Which parts of the creation narratives describe a spiritual creation and which describe a physical creation? So, unless we are given a key word we let the text stand and accept it as it is, without the need to turn it into metaphor or allegory. So, unless a prophet, or one holding keys to the scriptures, states that a particular passage is meant to be figurative, it is literal in its meaning. As to the doctrine of the church, it most certainly has a foundation of unchanging doctrine that all the prophets have, at all times, taught and upheld. If you want to talk about things that have little or nothing to do with that than have at it. As I have said before, evolution doesn’t concern me. I disagree with it, but I don’t think it really matters that much. But when a person denies that Adam and Eve were literal people, and that there was a literal Fall, than I have to speak out because these things are part of that foundation of unchanging doctrine, and thus to deny them is to step off of that foundation. Your use of faith does not make sense. Faith requires an understanding of what you are placing your faith in. Faith is not a blind hope that there is something out there. It is a reasoned hope the flows from understanding. So, I understand that many things must be taken on faith, but there still needs to be a foundation on which to base that faith. So, why should I have faith in God if, as you claim, I can’t every really know or understand him, or really know or understand that he exists? And again, even if I am creating a relationship with some unknowable being, why should I have faith that they are God? Without a reason to support it, there can be no real faith. “…I can’t ever really know or understand him, or really know or understand that he exists? ” I disagree. An illiterate disabled individual can know Christ every bit as much as the most doctrinally learned. Knowing and Understanding are two very different things. Perhaps they are not for you though. People are different and it seems likely your faith is a different shape than mine. You didn’t answer DB’s question. The whole point of the question is that there is no clear, neat, and tidy package presented universally by the Brethren since the time of Adam that outlines which parts are which (unless you’d care to enlighten us all, as invited by DB). Instead, we have varying opinions leaving room for varied interpretations. This doesn’t follow of necessity from your JS quote. What exactly are these “keys to the scriptures”, and where is this explicitly limited to GA’s? Couldn’t we all have some of this ability to interpret such things ourselves, guided by the Spirit? Couldn’t a “key word” be found elsewhere in the scriptures, or in the historical context, or in the usage of a similar word or phrase elsewhere, or in the historical record outside the scriptures, or in the findings of the scientific method? Even though Jesus didn’t always begin his parables with a “Once upon a time” or its Hebrew/Aramaic equivalent, I don’t feel the need to have an official statement from the Prophet to tell me that the good Samaritan may have been a fictional character. Do you? I mean, Jesus said “A man went down from Jerusalem to Jericho,” so it must be so? Was Jesus really not the masterful teacher I thought he was, coming up with the brilliant multi-layered extended allegory? He was just recounting a travelogue he’d heard from a buddy? And I disagree. There is a very unified package regarding all doctrine that the Brethren have always taught. There are details that are left out, but what is there is unified. It is in what we don’t have that they disagree, not in what we do have. So, until you can show that the leaders of the church have vastly different views on the basics, my point stands. You know, DB made the claim that Joseph F. Smith and Joseph Fielding Smith presented different views, and so I asked for the references. He failed to provide them. They are priesthood keys, of course. And I didn’t limit it to the GA. Put I do believe that priesthood keys are required. We read the Moroni had the keys to the stick of Joseph, or the Book of Mormon. Joseph Smith was given the keys to bring forth scripture. Until one holding such priesthood keys says a passage of scripture is figurative, why should be it is? I am all for personal revelation, and many people have had great truths revealed to them through the spirit. But only the one’s holding the proper priesthood keys can reveal such truths to the world. History can, at times, enlighten us; but not when it contradicts the words of God that He has spoken through His prophets. It can help us understand to a large degree that reasons for some statements being made, and can even make clear certain events that are alluded to in the scriptures, but that is as far as it can go. As to science, it has no power whatever to unlock the things of God. God can unlock science to our understanding, just as He can make Himself known to us. But just as we cannot know Him on our own, our science can never discover Him or His works. As to the stories of Jesus, you are now just trying to twist my words into absurdity. It is clear that Jesus is telling a story, as the scriptures themselves show. I don’t need a historian or scientist to show my this. Just as I don’t need anything but the scriptures to believe that Nebuchadnezzar saw an image in a dream. I don’t think the image ever really existed, but I know he saw it. Josiah, having inherited a crumbling and divided kingdom, sought for a way to reunite the people. So he called his scribes together and told them to compile all the religious texts of the various tribal deities and traditions and create a composite of all of them. He then worked with the High Priest, Hilkiah, to perpetrate a hoax on the people, hiding the book in the Temple so the workers would find it and then declaring to the divided people that all their religious views were really one, and here is the proof. So which version are you going to believe? Are you going to believe secular historians, or the scriptures? Do you put your trust in the prophets and the men of God who preserved the record, or do you trust secular men who have little to no real faith in God? Was there truly a lost book that Josiah found and used to restore the true worship of God in Judea, or was he simply a brilliant politician seeking to unite his people? To give another brief example, many historians want to claim that to different men wrote the book of Isaiah. They claim that since so much of it clearly describes the destruction of Jerusalem that those portions had to have been written after that destruction, and not 100 years before it, which is when Isaiah lived. Why do they make this claim? Because they cannot accept the idea that Isaiah could have seen that destruction through the Spirit of God before it happened. Therefore that portion had to have been written after. Do we accept what these historians say, or do we believe what the Bible says? handlewithcare: There is nothing wrong with being “on [one’s] own.” In fact, it is sometimes a virtue: consult the stories behind Mormon Heretic’s avatar, or my username. I’ll not defend the substance of Shematwater’s comments here (I disagree with them), but perhaps such a “feisty” thread is best left to end without the suggestion that truth needs consensus. It does not.